Now that it is fall I crave food from my childhood. I loved my grandma Tommy’s roast chicken. Prep Day: Mix together all spices in small bowl. Rinse chicken cavity and pat dry with paper towel. Rub each chicken inside out with spice mixture. Place 1/2 onion and 1/2 lemon into the cavity of each chicken. Place chickens in ziploc freezer bag and Freeze. 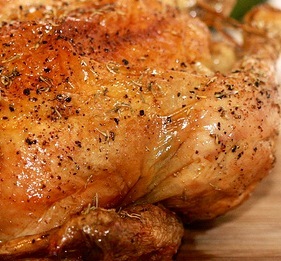 Serve Day: Place chicken in a roasting pan and bake uncovered at 250 degrees for 5 hours or until a minimum internal temperature of 180 degrees. Let the chicken stand 10 minutes before carving.